The condenser is a heat exchanger where the process heat absorbed by the refrigerant is given off to the air around it. As heat is given off by the high temperature high pressure vapor, its temperature falls until the vapor condenses to a liquid. Motor driven fans generate airflow across the condenser. The liquid receiver is a liquid storage tank for liquid refrigerant that is not in circulation. 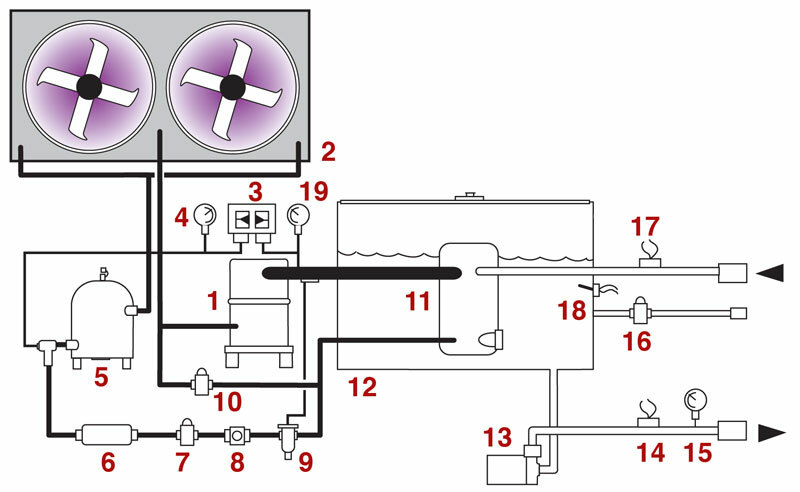 The receiver is required to hold the system refrigerant charge during service. Liquid slugging can cause severe damage to the compressor. The valve is opened when the compressor is on. Adequate refrigerant is determined by a clear liquid flow. Bubbles indicate a shortage of refrigerant. For more information about air-cooled portable water chillers call the Advantage Sales Department at 317-887-0729. Would you like to Download FYI #279 to your browser?